An outbreak of Equine Herpesvirus (EHV-1) has been traced to horses that attended the National Cutting Horse Association’s (NCHA) Western National Championships in Odgen, UT on April 30 - May 8, 2011. Affected horses have been identified in Arizona, California, Canada, Colorado, Idaho and Utah. To date there have been no reported cases in New Mexico. Although EHV-1 is highly contagious among horses, it does not pose a threat to human health. EHV-1 is transmitted primarily by aerosol and through direct and indirect contact. Aerosol transmission occurs when infectious droplets are inhaled. The source of infectious droplets is most often respiratory secretions. 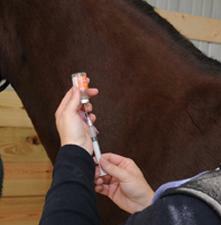 Direct horse-to-horse contact is a common route of transmission of the virus, but indirect transmission is also important. This occurs when infectious materials (nasal secretions, fluids etc.) are carried between infected and non-infected horses by people or inanimate objects such as buckets, etc. Fever is one of the most common clinical signs and often precedes the development of other signs. Respiratory signs include coughing and nasal discharge. Neurologic signs associated with EHV-1 are highly variable, but often the hindquarters are most severely affected. Horses with EHV-1 may appear weak and uncoordinated. Urine dribbling and loss of tail tone may also be seen. Severely affected horses may become unable to rise. EHV-1 can also cause abortion in pregnant mares. None of these signs are specific to EHV-1, and diagnostic testing is required to confirm EHV-1 infection and many horses exposed to EHV-1 never develop clinical signs. If you suspect your horse has been exposed to EHV-1, contact your veterinarian. In general, exposed horses should be isolated and have their temperatures monitored twice daily for 10 days. If an exposed horse develops a fever or other signs consistent with EHV-1 infection, diagnostic testing should be performed. Testing of healthy horses is generally not recommended. The UC Davis website has useful information for recognizing, treating and preventing EHV-1 in horses.